(Olivia Thirlby) have a rough day on the job in "Dredd"
Although calling it dreadful would be too-easy overkill, "Dredd" is surprisingly dreary for a comic-book action flick. Set almost entirely in a massive 200-story concrete slum, the movie plays like a violent but not terribly involving videogame that's a few years out of date and not much fun. It's hard not to think that zippier direction and more tongue-in-cheekiness would have done it a world of good. Karl Urban, best known as Dr. "Bones" McCoy in the last "Star Trek," plays the ruthlessly professional Judge Dredd, a high-tech supercop in a dismally dystopian urban future. The perpetually frowning lawman wears a helmet that covers the top half of his face in every scene except an obscured-silhouette opening. Tom Hardy may have thought he had it bad wearing a metal mouthpiece for most of "The Dark Knight Rises," but Urban never gets even a single reveal that shows anything above his five o'clock shadowed cheeks and upper lip. Keeping the character's eyes hidden at all times is faithful to Dredd's original British comic-book incarnation, making him seem nearly as emotionless as "Robocop." That comes in handy when he has to shoot his way through countless heavily armed perps to get at vicious drug lord Madeline Madrigal, aka "Ma-Ma" ("300"'s Lena Headey). Her organization is the source of a drug called Slo-Mo that lets users experience time at a fraction of its normal speed. Among the movie's under-the-influence shots is a gruesome shootout in which slow-motion bullets tear through various body parts with remarkably bloody results. Unlike the 1995 Sylvester Stallone dud "Judge Dredd," in which various transgressions included the star appearing unhelmeted to show off his kisser, this reboot is faithful enough to the comic to have the blessing of co-creator John Wagner. One thing Stallone had going for him, though, was his bulk. Urban is not nearly as physically imposing here, even in a much more protective-padded but less cartoonishly elaborate version of Dredd's "uniform." The screenplay by Alex Garland ("28 Days Later") teams Dredd with rookie judge Cassandra Anderson (a blond Olivia Thirlby), a telepathic beauty who also originated in the comic. Thirlby does a good job of appearing vulnerable and tentative without coming off like a skittish or sexist comic-relief cliché. Director Pete Travis ("Vantage Point") dutifully pits the duo against increasingly dangerous adversaries as they make their way up the levels of the tower block. 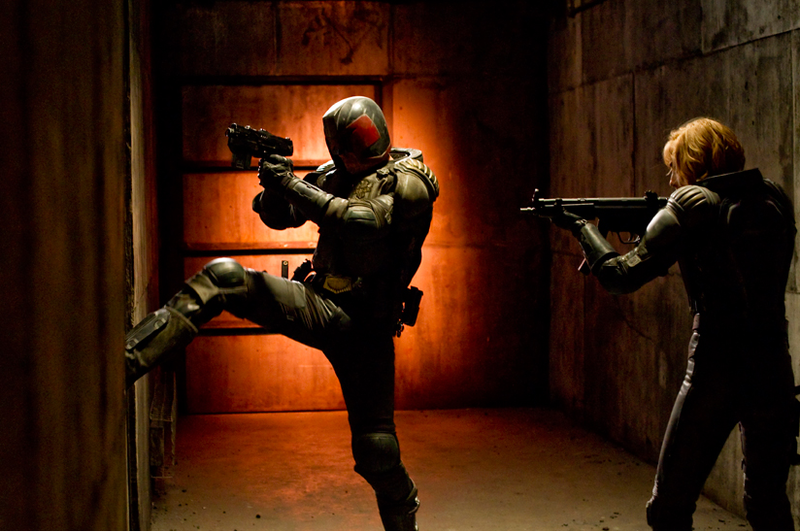 The cold-blooded Dredd and the empathetic Anderson are opposites who thankfully don't engage in a lot of typical buddy-cop repartee. The few zingers that do arise are amusingly deadpan instead of painfully jokey. Told by a superior to chuck Anderson "in the deep end" on her first day to see if she can sink or swim, Dredd replies, "It's all the deep end." When Anderson says she doesn't wear a helmet because it would interfere with her psychic abilities, Dredd sardonically remarks, "I think a bullet would interfere with them more." Parents are advised that thematic elements such as drug use, a suggestion of sexual violence and some viciously graphic brutality (including quick shots of a character being skinned alive) keep the R-rated "Dredd" from being Marvel-style kid-friendly.